Paws In Work offer specialist puppy therapy events to businesses where employee wellbeing is at the heart of their culture. In a nutshell, we bring a litter of puppies to your workplace to entice staff to take a 15 minute break away from the desk and de-stress with some puppy playtime! We fully transform a boardroom, staff lounge or dedicated ‘play area’ with artificial grass, picket fences, bean bags, cushions and cloudy lemonade for the ultimate summer-garden getaway experience. With an extensive background within the health and fitness sector, it was clear to see that companies wanted to invest more time into their staff wellbeing. With such little time for companies to truly focus on this, wellness events would sometimes be quite repetitive and time consuming, not being ideal for most. Having the benefit of owning a dog and living in London, I have experienced first-hand why ownership is not possible for everyone. People with typical, small London flats and long working hours are not always in the best position to own a dog, something that for me brings unmeasurable amounts of happiness. I was lucky to be able to work flexible hours which made this possible. There are many scientific studies showing that stroking and playing with pets can reduce cortisol levels, lower blood pressure, and improve mental wellbeing. With such a focus on mental health awareness at present, we knew there was a way that we could tie something together. 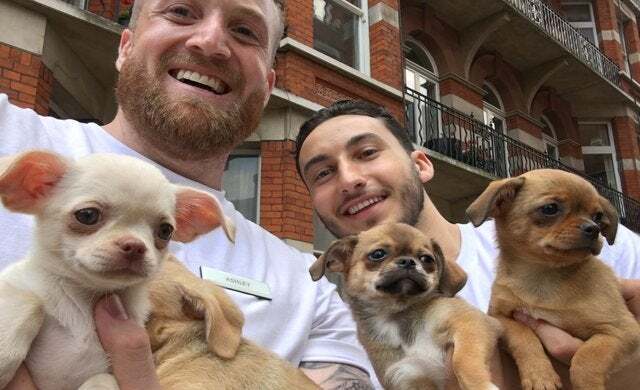 We approached a dog-friendly office with an idea of a wellbeing event involving puppies. The feedback was phenomenal. The event was a huge success and from there Paws In Work was born. I worked in health club sales. It’s funny, as much as we promoted the benefits of employee wellbeing and having a break away from the computer, we were probably the worst culprits for it. It was quite ironic. Something had to change. The networking you do whilst working in a health club is great, you never know which members are going to walk through the door, from directors to celebrities. It’s definitely made business development easier. Absolutely, I’ve set up businesses before and they haven’t worked out. In my opinion, it’s all part of the fun. As long as it’s not costing a fortune for the experience, I think you learn from every attempt. Even with an investment thrown at an opportunity, if everything falls through, I just look at it as a qualification. I’ve learnt all this, and it’s cost me this much. I think people can easily put too much pressure on themselves when setting up a company and it puts people off from trying. Expect to learn, not succeed. And, you never know, it might just stick. If it doesn’t, reflect on what you have learnt, what not to do next time, dust yourself off and go again with all that new knowledge. Sacrifice. Beg, borrow and pull-in favours. I have been lucky in that this start-up has not cost a huge amount to get going. I’ve always tried to be transparent with people when starting out. People are generally there to help and have your best interests at heart. Just don’t forget to look after those people when you are able to. A bottle of wine and a Christmas card can go a long way without costing much. In the simplest form, we offer a service. Reputable breeders are qualified and selected accordingly. Most breeders are interested in socialising their puppies with people and this is helped by the assistance of finding their pups new homes, to get paid on top of this, they usually welcome the opportunity. Breeders can spend the day shopping or alternatively talk to a host of potential new owners for their dogs. We also work with charities and dogs’ homes for events, helping to rehome dogs in need. Puppies in general are hugely popular, because of this our marketing is very organic. People tag their colleagues in social media posts and before you know it, more big-named companies see and want to be involved. Working with animals is always a guessing game and does have its problems. Prior event planning has to be meticulous and you have to be able to adapt to last-minute changes. I try to take the approach of learning from these problems as I believe it’s these that shape your business and help build grit and resilience. I think that the key is to not talk yourself out of something by focusing on the negatives. Things will not go to plan, challenges will arrive, but being able to deal with them head-on gives you a huge sense of achievement. From a branding point of view, the challenge was our perception. There is a stigma around mental health issues, and we wanted to be able to break that stigma with a brand that is young, on-trend and relatable. We definitely feel that the evolution of our brand has already helped us find a way of appealing to a mass audience whilst staying unique. I’ve always stayed in contact with people I have met over the years and, because of this, one of our first events was at the Warner Music Group office. To have such a big name attached to your company so early on really helped generate some new interest, helping us to be taken seriously. The cliché saying “don’t be afraid to fail” is definitely fitting, however, my advice would be to talk to everyone about your idea. Get feedback and welcome criticism. Enjoy the journey and don’t fixate on making it work early on, let the company evolve and don’t wait for a perfectly finished product before going to market. Just get it out there and make a start. To be happy. To make others happy and to make a difference to the world for the better. I would love to be in a position to support a family, but also help people fulfil their dreams. It would be great to be able to help those in need, and make a difference to someone’s day.